“It’s a definite evolution of what we were doing at AFFRM,” she said. “When I was out promoting ‘Selma,’ I became aware of so many other films that ought to be getting distribution. 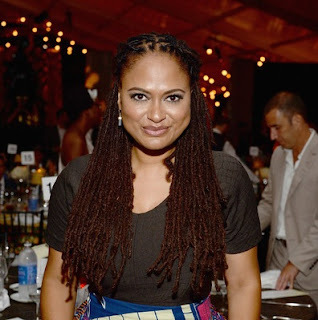 And this is a problem I can do something about because of my experience.” DuVernay said Array will distribute films via the theatrical arthouse circuit as well as on streaming platforms. If you've been following Tinsel & Tine then you know that I've been following Ava since she spoke at a luncheon in 2011 I'm so impressed with all she's able to do and that her accomplishments are being acknowledged. ARRAY's (dedicated to multi-platform distribution of black independent film) first acquisition is the award-winning drama, Better Mus’ Come, the debut feature from writer/director Storm Saulter. 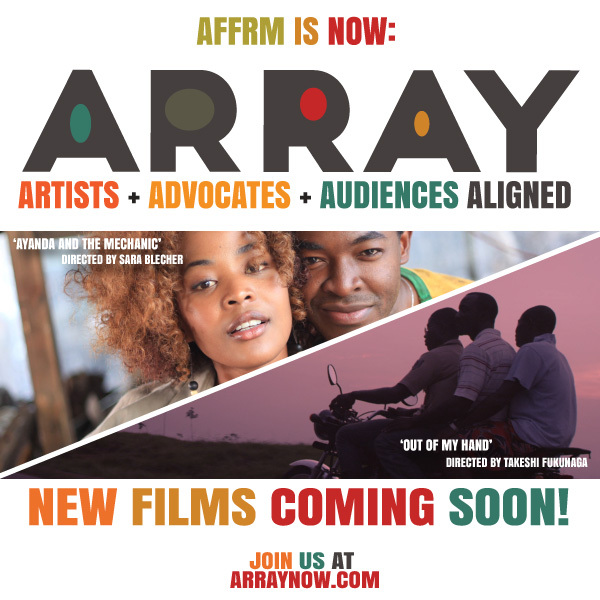 ARRAY has acquired all U.S. distribution rights. The deal was negotiated by Gordon Bobb of Del, Shaw, Moonves, Tanaka Finkelstein & Lezcano on behalf of AFFRM with theproducers. Storm Saulter’s Jamaican Epic Better Mus’ Come is a landmark in Caribbean filmmaking and a stunning love story unfolding at one of the most violent moments in Jamaican history, when rival gangs were enlisted by warring political factions to disrupt the democratic process - and bloodshed was unleashed on the streets. Winner of Best Feature Awards at Trinidad & Tobago Film Festival and Bahamas Intl Film Festival, Best Director Award at Pan-African Film Festival and Best Actor Award at American Black Film Festival, the film has screened at Toronto International Film Festival, Film Society of Lincoln Center and British Film Institute. The producer is Paul Bucknor, with executive producers Joshua Bratter and Samantha Bratter. will be in attendance for a post-film Q&A. ADD YOUR EVENT for FREE! - which includes SOCIAL MEDIA BLASTS! tinseltine@gmail.com Click AGENDA VIEW to see complete list of happenings. Cozy Quilt of Food Movies, we'll add more patches as T &T discovers more films where food plays the biggest "roll"
Videographer Oliver Gallini 5 min short featuring organic-chemist-turned-chef, Townsend Wentz, who got his start at The Four Seasons Philadelphia. Stockholm - Stockholm has its own unique sense of humor and pacing. The post Stockholm appeared first on CutPrintFilm. Gryffindor Red Velvet Cupcakes with Geeky Sprinkles - Make red velvet cupcakes representing the pride of House Gryffindor with these lightning bolt sprinkles from Geeky Sprinkles! CLICK IMAGE for our take on this Freddie Mercury & Queen music biopic! CLICK IMAGE for our look at this revival of the Rom/Com runaway hit! CLICK IMAGE to see post, sorry, it about the retrospective, not my reviews of the films. I saw 3 or 4, but never got a chance to get my thoughts down and now I don't remember the nuances. CLICK IMAGE to Check out T&T's 5 Favorite Moments from this 19th installment of the MCU! CLICK IMAGE for T&T's complete post on this phenomenal moment in movies! CLICK IMAGE for more on this new burger spot! CLICK IMAGE to find out more about this Philly Event space and the woman behind its success! CLICK IMAGE for T&T's Mini Movie Review on the Making of Charles Dickens "A Christmas Carol"
CLICK IMAGE to view Post on this Environment film tours stop in Philly! Tinsel & Tine is Proud to be a Community Partner with PJFF -CLICK IMAGE for Ticket Giveaway Contest! Boo2: A Madea Halloween Giveaway! Was Retweeted by Abdul himself - Ali Fazal! WHAT CAN I SAY, I LOVE CAKE! CLICK IMAGE to check out our post on Al Gore's follow up ot his 2006 doc "An Inconvenient Truth"
I've been the center judge at a fun summer baking contest hosted by ChrystinaNoel party expert blogger. CLICK IMAGE to check out the post! CLICK IMAGE to read post on my Cheesecake Surprise! Impressive directorial & screenwriting debut for Natalie Portman based on the memoirs of Amos Oz. Set in the 1940's "A Tale of Love and Darkness" is told through the eyes of a young boy during the period when Israel goes from being a British Mandate to its own Country. His experience is shaped more profoundly by his beautiful mother (Portman) who goes from telling fable like tales on a regular basis to slipping farther and farther into depression. Very melancholy film, but so beautifully captured. Early Oscar contender for sure! Director Mira Nair brings us an authentic look at Uganda and a reminder that brilliance can happen anywhere and in anyone! 5 outta 5 score! WIN ONE OF THESE 2 NEW SPRING COOKBOOKS! This month's Foodie Giveaway: THE QUICK SIX FIX by Stuart O’Keeffe (March 2016) Stuart demonstrates how to cut kitchen time, save money, and get out of the kitchen in thirty minutes or less. LOSE WEIGHT BY EATING by Audrey Johns (April 2016) who takes more than 130 recipes that are typically full of unhealthy processed foods and empty calories—recipes we simply shouldn’t eat every day—and creates skinny versions. Love @DisneyZootopia It's like an episode of "Castle" they shoulda had Stana Katic & Nathan Fillion do the voices! I am by far certainly NO expert on the Star Wars Franchise. Seen all 7 movies, but not with any depth of viewing. But as movie-goer, I really enjoyed Star Wars:The Force Awakens not just because you get to spend time with the original cast, but in terms of good story telling. I felt all the prequels with Hayden Christiansen & Natalie Portman were mostly forgettable because George Lucas is so obsessed with CGI and battles that there's very little to connect to in terms of heart & story. JJ Abrams knows how to create balance! What is a shnit film? Interview: Mekhi Phifer for "Insurgent"
Got a chance to talk to Mekhi Phifer at the Four Seasons Philadelphia, about being a part of the Divergent Series: "Insurgent". On a Food n Film note: Mekhi was hoping to have a Philly Cheese Steak while he was here but ran out of time. The Four Seasons is going to have to set up a delivery system with Pat's or Geno's, cause all the celebs want them when they come for these press junkets. Mehkhi also answers this question: If you could recreate any movie and put yourself in the lead roll, what would it be? Mouth.com - Our goal is to help you discover and get the best, most delicious and most interesting indie food products and to help indie makers grow their business. Debbie Allen graciously gave a free "Inside the Actors Studio" type visit to Philly at International House on July 2, 2014. Full of saucy humor and passion, Ms. Allen lectured on creativity, her life's journey, what it means to be an artist, her relationship with her sister Phylicia Rashād, the 18 years it took to get AMISTAD made and so much more... Click HERE to see video excerpt of her address to us lucky enough to attend this inspiring and insightful event. Follow Tinsel & Tine's board Philly Spotlight on Pinterest. CLICK IMAGE to check out our post on Al Gore's follow up to his 2006 Documentary "An Inconvenient Truth"
something superficially attractive or glamorous but of little real worth. “If thou tastest a crust of bread, thou tastest all the stars and all the heavens.” 1) Do they bring bread before the meal? 2) Is the bread good enough to be worth all the extra carb calories? 3) Is the bread warm? 4) Are you offered both room temperature butter and an olive oil dipping sauce? 5) Do they offer to bring you more bread! TRENDING RESTAURANTS IN PHILLY! CLICK HERE TO VOTE ON YOUR FAVORITE! is about discovering what I find pleasing in screening & eating - in case you missed it, the name is a play on Tinseltown using the Tines of a Fork. Will there ever be a cap on movie prices? Will we one day pay $20 a pop? Why don't we pay on a scale? A crap movie like everything Adam Sandler has ever done should cost about $4.50. Big action movies like"Lord of the Rings", "Iron Man," "Transformers" are worth $10. Woody Allen movie or something like "Silver Linings Playbook" $6-$7. A chick flick or light comedy $5.75 and most Indie Films $5.25. Surely I'm not the first person to realize this makes sense. Has it been voted on in the Motion Picture Industry and then vetoed? If so, why?